Astophotographer P-M Heden of the photography group The World at Night (TWAN) captured this image of a Perseid meteor soaring over the Baltic Sea on Aug. 12, 2013 from the eastern coast of Sweden near Stockholm. 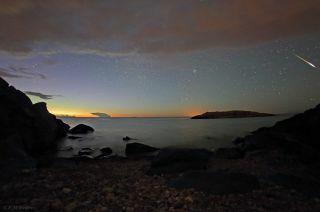 A dazzling meteor blazes across the night sky over the Baltic Sea in this spectacular view by a veteran photographer. Astrophotographer P-M Heden of the photography group The World at Night (TWAN) captured this image during the peak of the 2013 Perseid meteor shower on Aug. 12 from the eastern coast of Sweden near Stockholm.